The Sims 4's holidays, introduced in the Seasons expansion, do a good job of mimicking their real life counterparts. In order to complete holidays successfully, you have to achieve certain goals before the day is over. On Love Day, you’re expected to give flowers and go on a date. During Winterfest, you give gifts and wait for Father Winter to come. 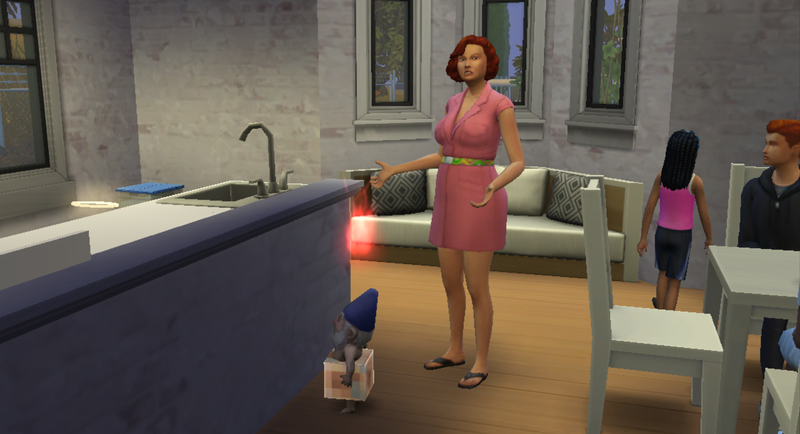 During Harvestfest, you make a big meal and then… appease the gnomes? Harvestfest is a new addition to The Sims series. In The Sims 3, there were yearly holidays to celebrate in their version of the Seasons pack, but Thanksgiving was not among them. Before holidays were introduced in The Sims 4, celebrating Thanksgiving in-game was a hassle. Sims never wanted to sit at the table at the same time, and sometimes they came over before the party even started. Seasons has made this event much easier. The game now has a calendar, with each season lasting seven days. Certain holidays, like Harvestfest, occur yearly. When holidays occur, your Sim will sometimes even get the day off work to prepare and celebrate. During the holiday you have to complete certain tasks, called traditions. On Harvestfest, you’re expected to decorate the house, have a grand meal, and get into the thankful spirit by telling other Sims what you’re thankful for. You also have the appease a trio of gnomes who appear in your house. You know. Typical Thanksgiving stuff. When you click on a gnome, it gives you different options of things you can offer it. You can give it a toy, a coffee or fruitcake, or a variety of other random objects or treats. There’s no rhyme or reason to this that I have discovered; you just have to guess. If you succeed, the gnomes will spawn seed packets throughout the day, which you can use to plant flowers, fruits or vegetables. If you fail, they break your appliances. These gnomes are the bane of my existence. Thanksgiving in real life is stressful enough without gnomes, and their existence in The Sims 4 just makes the game’s equivalent harder. Do you know how hard it is to cook a meal when your sink and oven keep breaking? By the end of the day, Sims are exhausted and stressed from just trying to keep everything contained. If there’s one thing I’m truly thankful for, it’s that the real-life Thanksgiving I celebrate does not have gnomes involved. At least, not that I know of. If there are any, that might explain why so many families end up fighting on the holiday. If things seem tense at your house, check for any gnomes that haven’t been appeased.